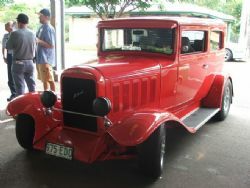 The Sunshine Coast Antique Car Club is the oldest club outside the metropolitan area in Queensland and was started in 1963 when six mates met in a garage looking for something to do on Sunday’s. It has blossomed into nearly two hundred and forty members today and the membership catchment area spans Bribie Island, Cooroy, Maroochydore to Maleny. One of the foundation members, Ian Hayne is still actively involved and the clubs oldest member is ninety four years young and still gets out and about in his Willy’s on club days. The club is very progressive and active and they hold a lot of runs, events and also do a lot of charity work on the Sunshine Coast. They have a monthly run on the fourth Sunday of each month and conduct a mid week run on Wednesday’s, normally on a monthly basis. To support their runs they have a catering van that is towed behind one of the vehicles providing participants with tea, coffee and barbeque facilities to enhance the social aspects that the members enjoy. Annually the largest event they run is the Nambour Swap Meet which is held on the last Saturday in July. In 2009 the event will celebrate its twenty first birthday and has become a fixture amongst vendors and buyers and is well attended by both. The Sunshine Coast Antique Car Club also holds an annual Motorkana Rally each year in May and this year will be its fortieth milestone. Members also participate in the Four Club Rally in association with three other local clubs and relish the opportunity to drive their cars and meet like minded enthusiasts. Apart from financial assistance to local charities club members also provide static displays at nursing homes, school fetes and charity events. They have taken people for rides in their cars to assist in fund raising activities and do a lot of work supporting various Cancer charities and the Helping Children Smile Foundation. 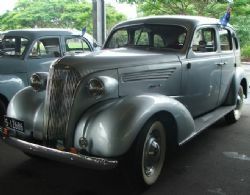 Membership is available to anyone that shares an interest in old cars and you do not need to have a car to join the club. Annual dues are twenty five dollars and there is a five dollar joining fee. The members receive an informative monthly magazine, either in print or electronic form and the club holds monthly meetings on the fourth Tuesday of every month and a committee meeting on the second Tuesday of each month. Attendance is good with sixty members normally turning up for a monthly meeting. 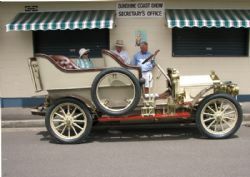 The Sunshine Coast Antique Car Club has clubrooms in the grounds of Nambour Showgrounds and the facilities include an extensive library, TV, manuals and a big three bay shed to keep all the gear in. On site is a club caravan that has been re purposed as an office for the swap meet providing a hub for members involved in the organisation and running of the event. The club does not believe in competitions and a vehicles badge is optional. New members are welcome and all marques over 30 years old are accepted. 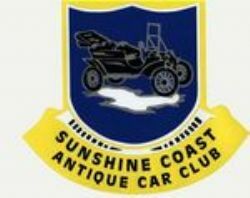 If you are interested in joining the Sunshine Coast Antique Car Club you can contact the president, Trevor Shields on (07) 3408 2364 and the link below provides more information on the club website, events and general information.